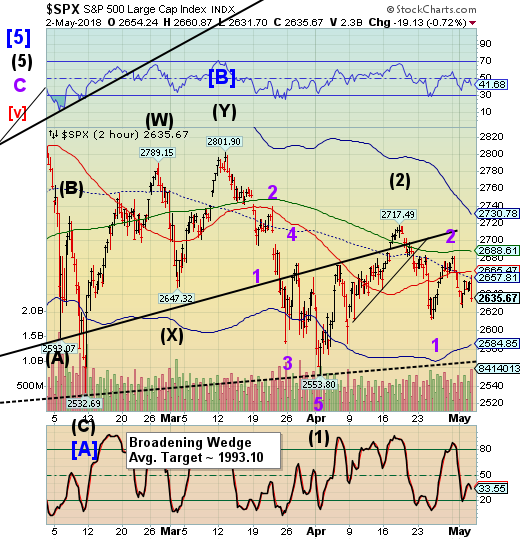 SPX futures are down and appear to have declined beneath the May 1 low. The Dow is the first major Index to break its 200-day Moving Average on no news. NDX futures are lower this morning, as well. ZeroHedge observes, “It has been a confusing 24 hours, with US futures slumping after yesterday's unexpectedly hawkish-yet-dovish FOMC, which first slammed the dollar, then sent the USD surging, and sparking an equity selloff even as rates remained relatively unchanged. Today's this confusion spilled over into international markets, with both Asian and European shares retreating, as traders are on edge ahead of the US-China trade talks taking place today and tomorrow. VIX futures are higher, but have not exceeded the May 1 high, much less the Wave 1 high at 19.84. 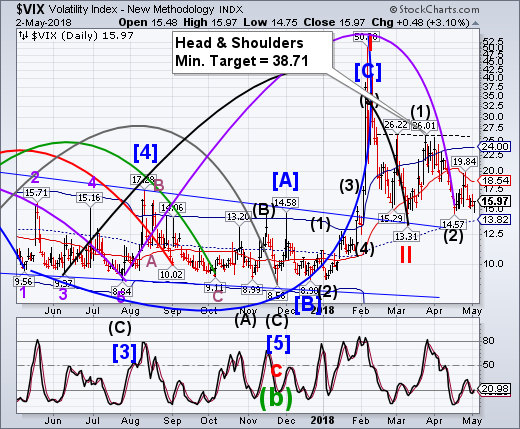 To many, VIX appears to be “normal.” However, note the rising bottoms, suggesting a growing upside momentum. The breakout ma be spectacular. 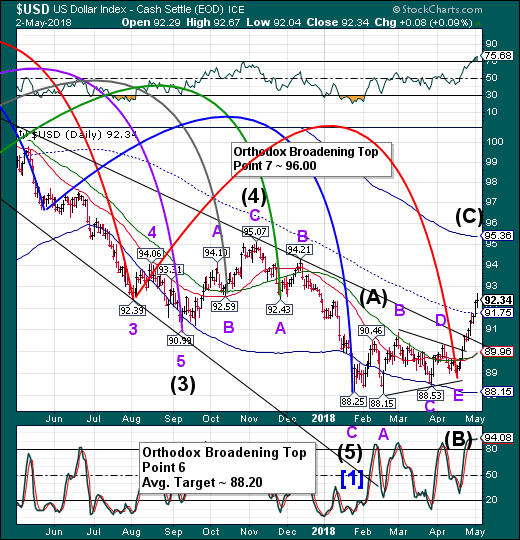 TNX is “hugging” the trendline at 29.30, but hasn’t yet broken down. 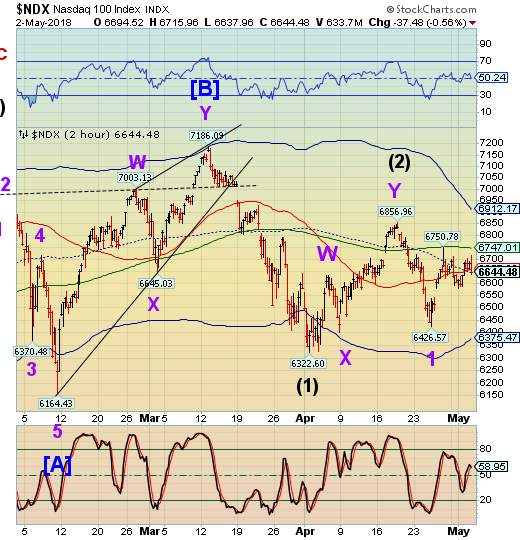 Please read my Mid-Week Report on UST. The Commercials are hugely net long UST while both large and small Speculators are hugely net short. A breakdown appears to be about to happen. 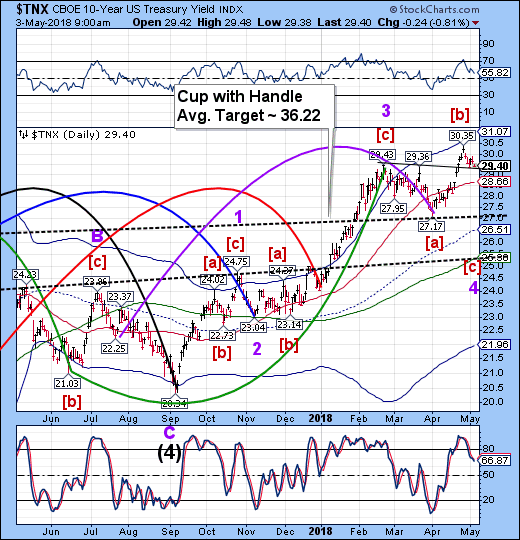 Lance Roberts observes, “In early 2018, I penned a post which illustrated the legendary Bob Farrell’s 10-investment rules. Bob, one of the great investors of our time, had a very pragmatic approach to managing money. Investing rules, and a subsequent discipline, should be a staple for any investor who has put their hard earned “savings” at risk in the market. Unfortunately, far too many invest without either which leads to less than desirable outcomes. USD futures are taking a bit of a reprieve this morning. There is nothing in the Cycles Model to suggest a reversal here, but we may expect to see a pullback to mid-Cycle support at 91.75. Those still short the USD may have a chance to get off the boat.